Images of comet 67P/Churyumov-Gerasimenko taken on July 14, 2014, by the OSIRIS imaging system aboard the European Space Agency's Rosetta spacecraft have allowed scientists to create this three-dimensional shape model of the nucleus. 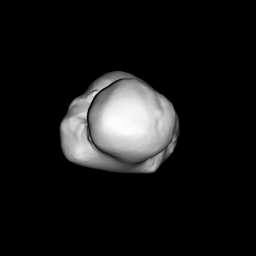 The full rotation of the nucleus around its spin axis, shown here, emphasizes the bi-lobate structure already observed with the camera. OSIRIS was built by a consortium led by the Max Planck Institute for Solar System Research, Gottigen, Germany, in collaboration with the Center for Studies and Activities in Space, University of Padova, Italy; the Astrophysics Laboratory, Marseille, France; the Institute of Astrophysics of Andalucia, Spain; the Scientific Support Office of the European Space Agency, The Netherlands; the National Institute for Aerospace Technology, Torrejon de Ardoz, Spain; the Technical University of Madrid, Spain; the Department of Physics and Astronomy of Uppsala University, Sweden; and the Institute of Computer and Network Engineering of the Technical University, Braunschweig, Germany. OSIRIS was financially supported by the national funding agencies of the German Space Agency, Cologne, Germany; National Centre for Space Studies, Paris, France; Italian Space Agency, Rome; Ministry of Education and Science, Madrid, Spain; the Swedish National Space Board, Solna, Sweden; and the European Space Agency Technical Directorate, Paris, France.